Just take a look at these! Just by looking at this photo, I want to eat them all. These almond crisps aren't too sweet and they are very crispy! The most important thing is, they are very simple to make. Beat the egg whites, sugar and salt until frothy. Sift over the flour and mix until smooth. Add the melted butter into the mixture. Add the almond slices, mix gently so you don't break the almond slices. On the baking tray lined with baking paper, spread the mixture evenly and as thin as possible. 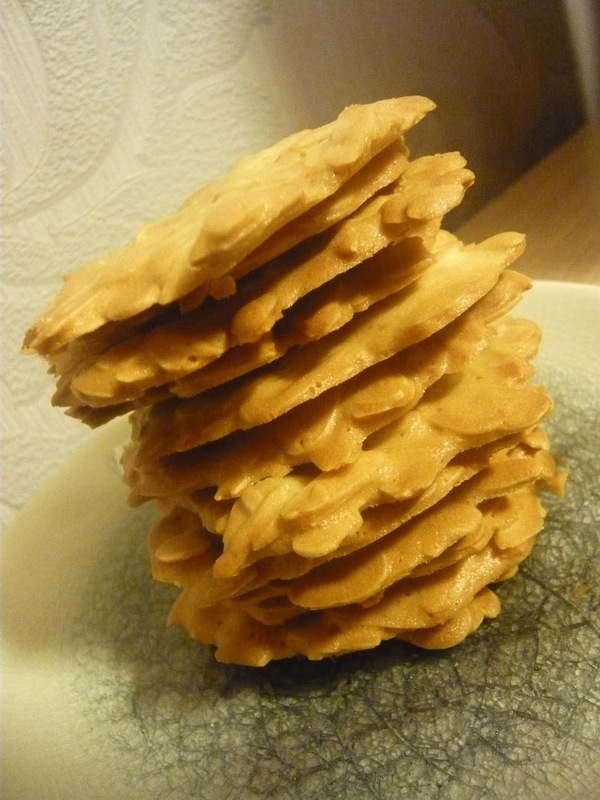 I used 1 tablespoon of mixture per almond crisp and each of the crisps has a diameter of 7cm. Bake at 150C for 12 minutes then 130C for 6 minutes. When the crisps come out of the oven, they are soft. Transfer onto a wire rack to let cool. The crisps will become crispy when they cool down. And the last step is...ENJOY!